Shipping containers storage is our most flexible storage solution for your belongings. With 24/7 access 7 days a week, they are very popular with business which may need access outside of our office hours. They also benefit from the ability to drive straight up to the doors, reducing the amount of time carrying heavy items to and from the container. Do you have different sizes? Yes. 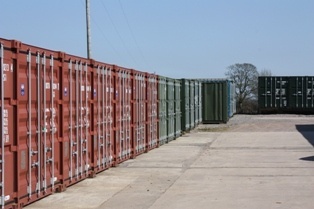 We have both 20ft and 40ft containers on site. Is there a limited amount of time I can store? No. You can storage for as little or as long as you like. Even if it is for 1 day only. How safe are my belongings? We can 24/7 CCTV around the entire premises and live on-site staff. Our containers can also have up to 4 padlocks securing them, so please feel free to use them all. Are they dry and damp proof? All our shipping containers are brought new. They are completely wind and water tight, they also have vents to ventilate the airflow. However due to the nature of the containers they can sometimes sweat and condensation can form inside the container. 99% of the time this is not the case, but we do not like to guarantee it. What should I do if my container does sweet? We do sell absorb poles which you place inside your container. They collect any moisture in the air. There are used in shipping container which transport good overseas, so they are very effective on stationary shipping containers. They normal last for 6 months before needing to be change. "we used a 20ft shipping container for our stock over flow. Very happy just what we needed"
"Clean, dry and secure. No complaints"
"My husband and I rented 2 containers from Mendip Self Storage to store our house items whilst we moved. Was pleasantly surprised by how helpful the staffs were. Thank you again.